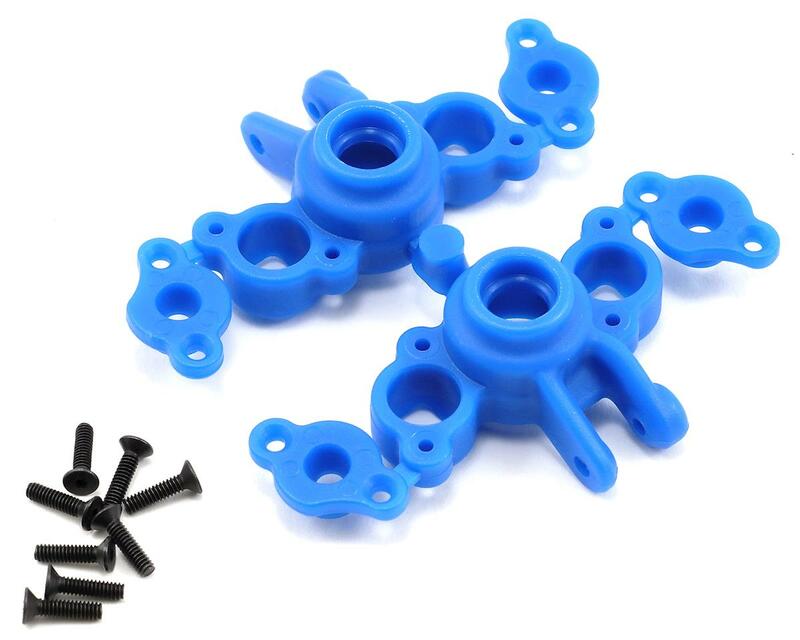 This is a set of optional RPM Axle Carriers, and are intended for use with the Traxxas 1/16 E-Revo and 1/16 Slash trucks. There is very little that can be as frustrating on an R/C vehicle as slop in the suspension system. In the case of the 1/16th scale mini E-Revo and mini Slash, there is absolutely no slop adjustment for the suspension pivot balls. Once the axle carriers begin to wear at those balls, the camber, toe and caster angles don’t stay true, causing the vehicle to wander, making it very difficult to control. That is where RPM steps in. Their 1/16th scale mini E-Revo and mini Slash Axle Carriers have a unique pivot ball retention system that locks the pivot ball in place, yet still allows for adjustment to compensate for wear. This system is based on a cap design, held in place with a pair of small screws. Simply slip the caps in place, tighten the flat head screws until the free play of the pivot ball is eliminated and you’re ready to go! RPM Axle Carriers have been completely redesigned for added durability and crash-survivability. RPM engineers found that the stock pivot ball opening could be reduced in size to help support the pivot ball better, meaning a significantly lower chance of pulling the ball through the hole. The redesigned overall shape and superior materials that go into the RPM design make them the best alternative at the lowest price available! 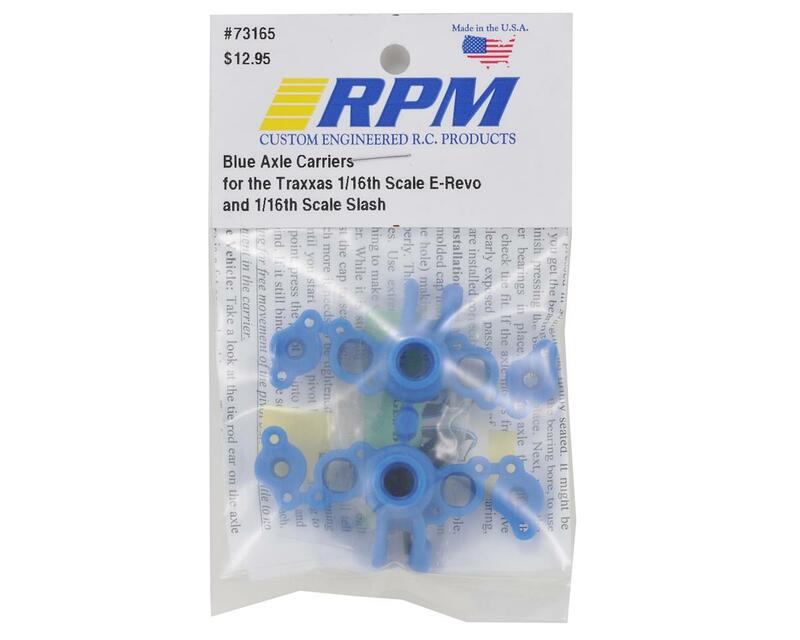 To top it off, RPM axle carriers are marginally lighter than the stock versions! Designed, manufactured and molded in sunny Southern California, RPM brings pride to the expression “Made in the USA”! this axle-carrier/knuckle however great at start, will wear out where the inner and outter bearings are. this creates a lot of slop after 10 or so runs. i don't recommend this product. my recommendation goes to GPM's machined aluminium knuckle.